Luis Robert does not have any MLB stats for the season. Single … Twitter: @LMoiran … Instrgram: @LuisRobertm56 ... Won the gold medal in the 2014 Pan American games ... Played with José Adolis García at Ciego de Ávila, who is the brother of Atlanta Braves third baseman, Adonis ... Graudated from Eide High School in Ciego de Ávila, Cuba. Spent the entire season with the Dominican Summer League White Sox in his first year with the organization ... Agreed to terms on a minor-league contract with the White Sox on 5/27, including a $26-million signing bonus ... Hit .364/.563/.455 vs. lefties, .301/.480/.548 vs. righties and .319/.484/.617 on the road ... Was successful on 12-15 (80.0 percent) of steal attempts ... Made his professional debut on 6/12 vs. the DSL Diamondbacks, going 1-2 with a solo home run and a walk ... Recorded multihit efforts from 6/22-23 vs. the DSL Orioles ... Did not play from 7/5-20 due to a minor injury to his left meniscus suffered on 7/4 while attempting to steal home ... Registered three hits on 8/3 vs. the DSL Reds and 8/26 vs. the DSL Padres … recorded multihit efforts in each of his final three games from 8/24-26 ... Finished the season rated by MLB.com as the No. 22 Prospect in baseball and No. 3 in the White Sox organization … was ranked the 45th-best prospect overall by Baseball America. Appeared in his fourth season with Tigres de Ciego de Ávila of the Cuban National Series, making 45 appearances in right field, seven in center and five in left ... Helped the Tigres win their second straight league title ... Led the team in average (.401), on-base (.526) and slugging percentage (.687) and steals (11), ranked second in homers (12) and runs scored (51), third in walks (38) and fifth in RBI (40) ... Tied for third in the league in homers and ranked fifth in steals … would have led the league in on-base percentage (by 49 points) and average (by 91 points) if he finished out the season ... Played with the Cuban National Team in the CanadianAmerican Association and was the youngest player on the team ... Left Cuba in November and established residency in Haiti. Played in 68 games in his third season with Ciego de Ávila, winning his first league championship ... Played for the U-18 Cuban National Team at the World Cup in Japan … lead the team with a .406 average … finished tied for second in the tournament with two home runs and 11 RBI. l Was named to the All-Tournament Team in the U-18 division. l Ranked by Baseball America as a Top 5 Cuban Prospect. Played in his second season with Ciego de Ávila, appearing in 54 games (35 in left field, 11 in center and one at first base) ... As a 16-year-old, was teammates with White Sox No. 1 Prospect Yoán Moncada with the Pan American U-18 Cuban National Team in Taipei, Taiwan … also shared an outfield with Yusniel Díaz (Los Angeles-NL) and Jorge Ona (San Diego) ... Hit .383 with four homers during the Pan American games. Played in 17 games in his first season with Ciego de Ávila. Was a member of the U-15 Cuban National Team that finished second in Mexico … hit .348 with nine RBI during the tournament. 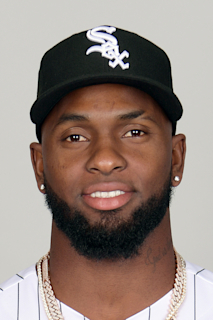 January 22, 2019 Chicago White Sox invited non-roster CF Luis Robert to spring training. August 7, 2018 Winston-Salem Dash activated CF Luis Robert from the 7-day injured list. July 31, 2018 Winston-Salem Dash sent CF Luis Robert on a rehab assignment to AZL White Sox. July 3, 2018 CF Luis Robert assigned to Winston-Salem Dash. July 1, 2018 Winston-Salem Dash placed CF Luis Robert on the 7-day disabled list retroactive to June 29, 2018. June 21, 2018 CF Luis Robert assigned to Winston-Salem Dash from Kannapolis Intimidators. June 5, 2018 CF Luis Robert assigned to Kannapolis Intimidators from Winston-Salem Dash. April 5, 2018 CF Luis Robert assigned to Winston-Salem Dash from DSL White Sox. January 22, 2018 Chicago White Sox invited non-roster OF Luis Robert to spring training. May 27, 2017 Chicago White Sox signed free agent OF Luis Robert to a minor league contract. May 27, 2017 CF Luis Robert assigned to DSL White Sox.